Please note that this current website does not have a shopping cart. To buy our Iroquois Necklaces online, please go to our e-commerce website at NaturalExotics.ca. 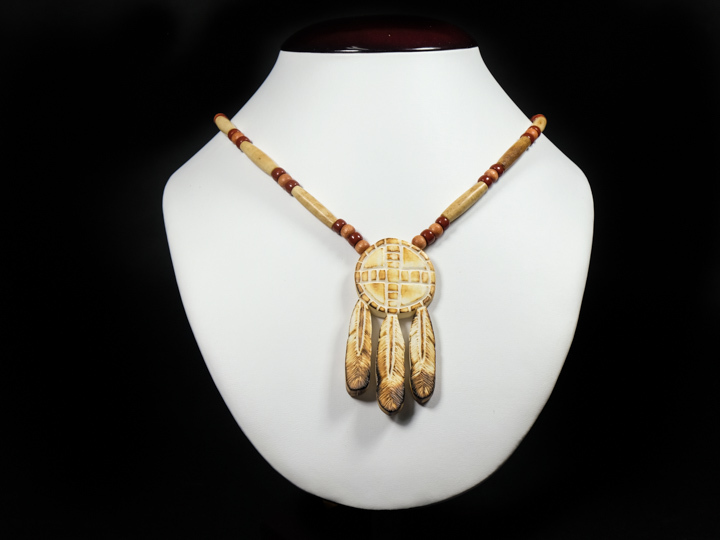 These are beautiful, native-made Iroquois necklaces with handcarved cow bone pendants. We have several styles available, each decorated by bone hairpipes and colorful beads. Some necklaces have deerskin straps. Their hanging lengths range between 29 to 43 cm long. For more information, see our gallery on NaturalExotics.ca. Deer and Cow are not endangered and are not subject to CITES controls.